What is Let`s Speak Art!? Pansodan Scene will welcome from the middle of October a new regular program. `Let`s Speak Art!` is a series of friendly gatherings around the topic of art theory and techniques. The idea, conceived by Borbála Kálmán, a Hungarian art historian and curator living in Yangon since early 2014, is to provide regular sessions where artists, art lovers, actors of the art scene can share ideas around a specific topic for each session. The so called `art history club` would like to focus on issues around the contemporary art scene but also provide some background information on earlier art tendencies not only from Asia but also from Europe. Hence, the talks would also help discover the different cultural contexts which have brought to life such movements as Surrealism, Cubism or given birth to the first conscious Abstract art works of the 20th Century. Each session will have a different topic, so everyone can join anytime, however, it`s worth taking part as often as possible to encounter various aspects of the art scene. The sessions would give priority to a presentation each time on the chosen topic to afterwards open the discussion towards the public. For each occasion, an interesting visual material will be projected to illustrate the topics. 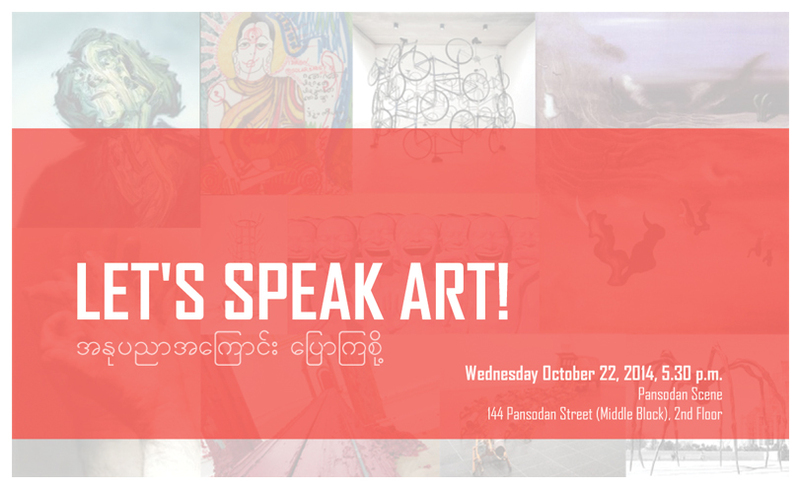 The `Let`s Speak Art!` sessions will be organized in association with Myannmar Art Resource Centre and Archive (MARCA), a young project dedicated to collect and digitize documents and books from the Asian art scene with a particular focus on Myanmar. For each `Let`s Speak Art!` session, some books relating to the current topic will be chosen and brought along for the audience to discover them at Pansodan Scene. MARCA has recently joined Asia Art Archive`s Open Edit: Mobile Library Project: starting in November in Myanmar, it will enable several hundred of books on art to travel in the entire country. The LSA! sessions will be in English with handouts in Burmese – but don`t worry, friends will surely help to translate the missing words! When is LSA! taking place? LSA! will take place about every third week at Pansodan Scene. Depending on the number of people and the complexity of the topic, the sessions will start at about 5.30 p.m. and finish around 7.00. From the first session on October 22, a Wishbox will await your questions and suggestions. The aim of LSA! is to talk about subjects difficult to find in books and share information and experience about unusual aspects too. It probably won`t be possible to answer all the questions and go through all the suggestions but each session would end with a selection from these `wishes` with the hope to give supplementary information about them. If you are interested in general or specific matters, like what is the edition number of a photography for or why was the word `impressionist` a pejorative designation at the beginning, come and write your question down! What is the next topic? The first session of LSA! will focus on the actors of the art scene: from museums to art fairs through galleries, auction houses and non-profit art spaces, the objective will be to get a closer insight about how the art scene works and how do the actors relate.